Maruti Suzuki is looking forward to launch a brand new Multi Purpose vehicle in the Indian market which is likely to be developed basing on Wagon R hatchback. Wagon R has its own fan base in the domestic market and the upcoming MPV is also expected to be a big hit in India. Concept form of the model has been revealed recently over web and it has become one of the hot topics over web from past few days. The native Indian giant has introduced the first edition of Wagon R to Indians in the year 1999 and it has become one of the most sold hatchback models in the country. The manufacturer has launched some major upgrades of the hatchback in the year 2003, 2006 and in 2010 respectively. Maruti Suzuki is already holding major part of sales with the Ertiga MPV but the competition in the domestic market has increased enormously. Thus the Indian giant is looking forward to strengthen its portfolio by launching the new Wagon R MPV. As per the information, the manufacturer is going to launch n five seated and seven seated variants of the MPV. Five seated version of the model has been codenamed as YCA currently whereas the seven seated version is codenamed as YJC. Maruti Suzuki is likely to power the Wagon R MPV with either of a 1.0 litre three cylinder engine or a 1.2 litre K series petrol engine most probably. The manufacturer has showcased the seven seated Wagon R concept at the Indonesian International Motor Show held in the year 2013. As per the information, the overall length of the vehicle is likely to be kept same and the engine options are also the same. There is no further update of the model so far but some sources have revealed that we can expect the official debut of the MPV by the end of festive season in the year 2016. 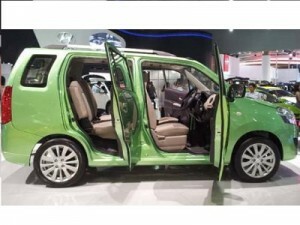 Maruti Suzuki Wagon R MPV is expected to take on rival models such as Datsun Go + and etc. This entry was posted in Autos, News on May 18, 2015 by UdutaHK.